Conor Becker is shown pinning his opponent from Tuslaw on Sunday. 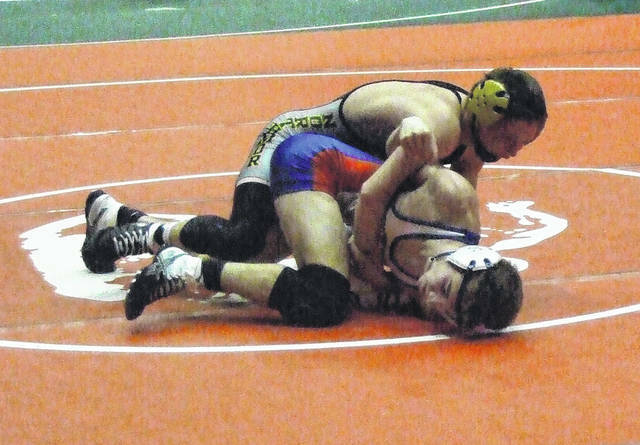 Gavin Ramos, shown trying to turn his Tuslaw opponent, was one of six Northmor wrestlers to earn wins in their state duals match on Sunday. Northmor’s seventh-seeded squad had a huge challenge. Not only did the Mustangs boast 11 state-ranked wrestlers in Division III, they also were able to fill all 14 weight classes. The Knights had forfeits at 182 and 220, placing them in a 12-point hole before the first match had been contested. In the end, despite suffering a 43-25 loss to the eventual runner-up team, Knight coach Scott Carr was extremely proud of how his team battled. The Knights held a 22-15 lead after the 152-pound bout, but only got three points over the final six classes, as Tuslaw battled back for the win in the quarterfinal match. The Mustangs took a quick 9-0 lead after Jacob Kuhlins pinned Dale Brockwell at 106 pounds and Joe Viront topped Manny Heilman by a 5-0 margin at 113. Northmor would then win five of the next six bouts to take that seven-point lead. At 120 pounds, Austin Amens battled back from an early 3-1 deficit to edge Andrew Wenzel by a 6-4 margin. Gavin Ramos followed at 126 with a 15-5 major decision against Jamie Viront and Aaron Kitts pinned Connor Brennan at the 2:25 mark to give Northmor their first lead at 13-9. Carr noted that competing in the state duals was perhaps most beneficial for wrestlers like Amens and Ramos, promising sophomores who currently don’t have as much postseason experience as other wrestlers on the team. A pinfall win at 138 pounds by Brier Marthey over Eli Davis gave Tuslaw the lead momentarily, but Northmor’s Becker brothers put the Knights back on top. At 145 pounds, Conan Becker claimed a hard-fought 6-2 decision over Brennan Shirley and then Conor Becker overwhelmed Greg Eberhardt in earning a pin in 1:15. Tuslaw would win five of the final six matches to claim the win, though. Kyle Rider (160) and Stephen Skeens (170) earned technical falls over Tony Martinez and Wyatt Lessick, respectively, while Jake Loar (182) and Crawford Hamrick (220) won by forfeit and 285-pounder Brayden Phillips pinned Tyson Moore. Northmor’s one win in the upper weights came from Austin Wheeler. The All-Ohio football player who decided to try wrestling for the first time as a senior picked up a 7-2 decision over Austin Byall to provide his team’s final three points. Despite falling in the first round, Carr found plenty of positives in his team’s trip to Columbus. Not only did the meet give his wrestlers something to work hard for during a time in the season they usually suffer through a lull before the postseason, but after falling just short of the state meet in previous years, simply advancing this far was a noteworthy accomplishment.